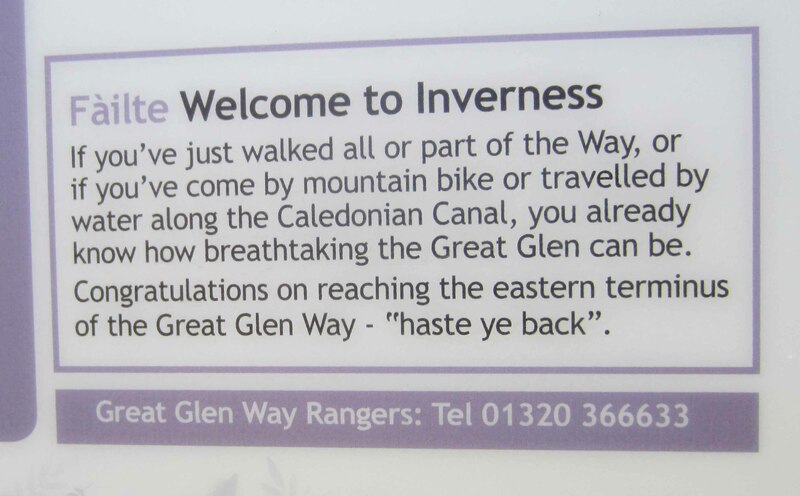 The last leg of the Great Glen Way was straightforward – a day’s walk that took us along a clearly marked, well-worn track through conifer forests, moorland and farmland down to the beautiful parks and public gardens of Inverness. We had arrived on the other side of Scotland! … at the end of a long walk. After a bath and a quick rest at the creaky but comfortable Acorn B&B we headed for Jimmy Chung’s All-You-Can-Eat smorgasbord restaurant to celebrate. I tucked in to a big and very unhealthy meal of limp fried chicken dug up from its grave in a heap of greasy fried rice. This was followed by an even more unhealthy dessert of super-sweet, soft-serve ice cream topped with caramel goo all washed down with fizzy cider. This gastronomic cavalry charge should have broken through the defence lines of my digestive system and inflicted heavy casualties, but my stomach got up from the table and headed out the door totally unscathed, although at least a kilo heavier. 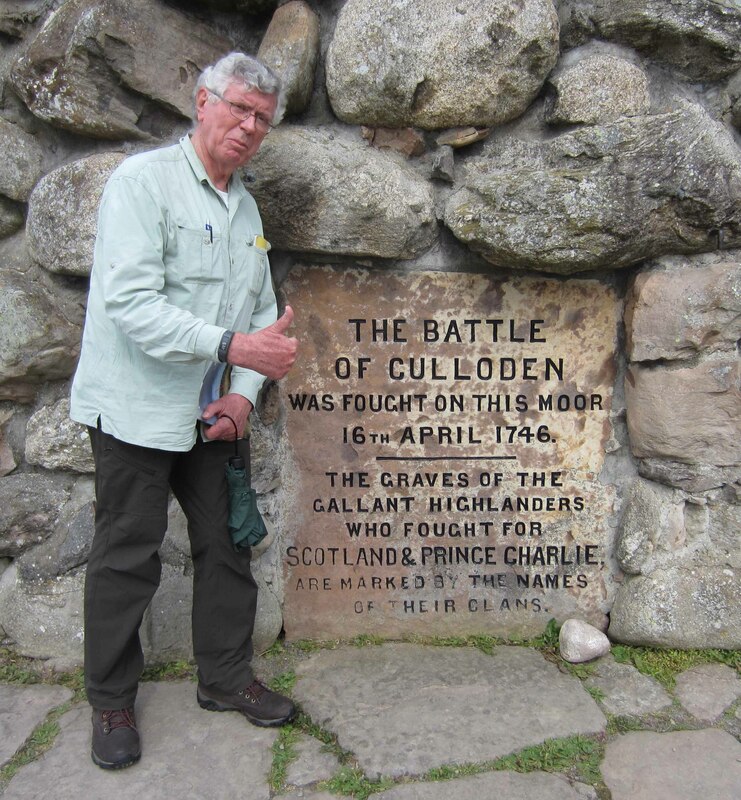 My digestion had been battle-hardened by daily meals in the pubs of highland Scotland. It was now equal to any challenge, even Jimmy Chung’s. I had a special reason for loitering a day in Inverness – I wanted to visit the scene of the Battle of Culloden (1746) in which Hanoverian English forces and their Scottish allies commanded by Lord Cumberland smashed the rebel Scottish army under the Jacobite Prince Charles Edward Stuart, better known as Bonnie Prince Charlie. Echoes of the calamity have survived into the twentieth century in the worldwide Scottish diaspora triggered by English actions after the battle. I can remember my grandfather John G. Quinn talking eloquently about the great Scottish victory over the English at Bannockburn (1314) but speaking with equal bitterness about the disaster of Culloden. It must have been during a winter visit to our home in Benneydale in the centre of New Zealand’s North Island when I was about nine or ten years old. Granddad – known as “Grumpy” – sat up late into the night with me and my brothers Jim and Keith in our darkened living room before the slowly dying glow of a coal fire. We were all in our pyjamas ready for bed, but bedtime came only when we fell asleep on the cool linoleum of the living room floor. Grumpy taught us American songs (“My name is Yon Yonson, I come from Wisconsin…”) and Scottish songs (“Just a wee deoch ‘n doris, just a wee dram that’s a’…”) and snatches of poetry by Robert Burns (“Wee sleekit cowrin’ timrous beastie…”). His face flickered black and orange in the firelight as he described the catastrophe of Culloden, the seizure of highland lands, the dismantling of highland culture and the brutal ethnic cleansing of highland Scots by the English and their Scottish allies. Culloden and a pungent, smoky fireplace still go vividly together in my memories of childhood. My grandfather, by the way, was not a highland Scot. He was of Irish descent from a family that had migrated to Scotland more than a hundred years after the Battle of Culloden. Yet he felt a kind of Celtic solidarity with the Scottish victims of English barbarity and arrogance. On Friday August 14th Emmy and I boarded a commuter bus for the half-hour ride to Culloden Moor on the fringes of Inverness. The site of the battle has been fenced off from the creeping approach of suburbia, and a custom-built information centre stands at the edge of the moor. This hosts one of the finest reconstructions of an historical event I have ever seen. It is especially impressive for its determination to accurately represent both the Jacobite and the English government causes. The bleak Culloden Moor, much the same today as it was in 1746 when it was the unlikely scene of a battle that changed the course of Scottish history and world history. The multi-media halls present the Jacobite story on one wall and the English story on the opposite wall. I found this even-handed coverage to be illuminating. It was also challenging because it undermined some of my long-held pro-Scottish sympathies. It gave me a view of the campaign that was much more rounded than Grumpy’s stories. Having taken in the pre-battle information, visitors are ushered into a seatless cinema where a truncated and very realistic re-enactment of the battle is projected on 360 degree surround screens. It is as if you are standing between the two armies. You come away with a vivid picture of how hopelessly out-gunned and out-maneuvered the Scottish rebels were. They were good at close-quarter fighting but Cumberland’s forces were much better armed and better disciplined. Fired from a distance their grapeshot and musket balls made short work of the rebels. After the five-minute show you leave the small cinema shaken by the brutality and inevitability of the slaughter. But the best (worst?) is yet to come. The cinema delivers you onto the battlefield itself. The flat moorland, covered in tussock grass and heather, is little changed from 270 years ago. Blue flags (Jacobites) and red flags (government) show where the two armies lined up. Discrete memorial stones show exactly where clansmen fell. 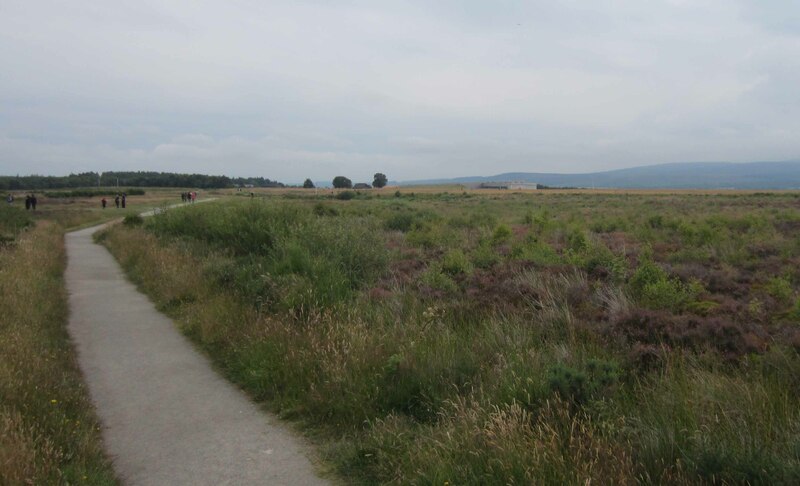 Low-profile paths make it possible for visitors to walk the battlefield and view the terrain as the Jacobite and government troops would have seen it. 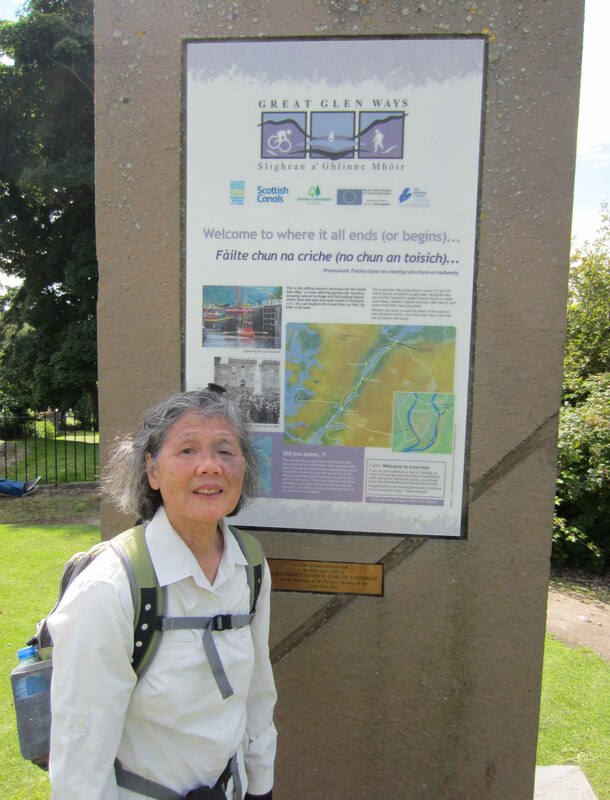 To walk those paths under a dour Scottish sky is a memorable and sobering experience. At a pro-Jacobite memorial cairn on the Culloden battlefield. The following Tuesday, after a three-hour train ride south, Emmy and I were in Edinburgh. 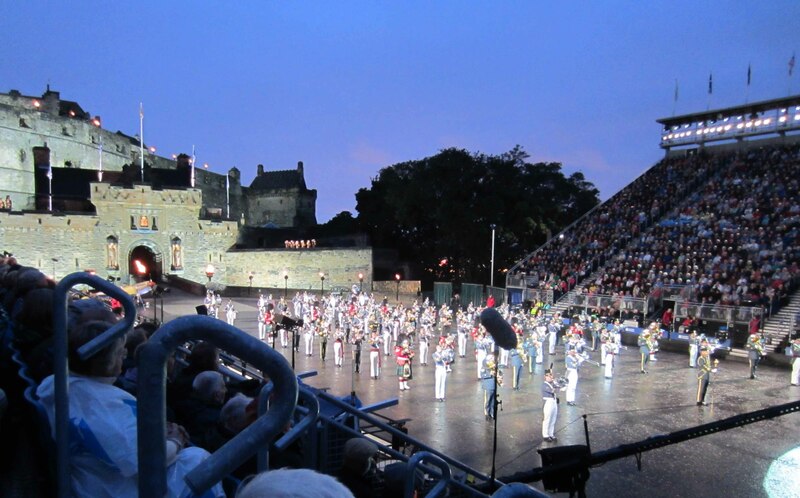 At nine o’clock in the evening we clawed our way through festival crowds to Edinburgh Castle where the annual Royal Military Tattoo is held. As we shuffled to our seats on terraces above the parade ground I was preparing to grind my teeth for ninety minutes. I would be muttering adjectives like “jingoistic”, “kitschy”, “over-the-top”, “crass” and “clunky”. I practised rolling my eyes. But the very first minute of the tattoo routed my prejudices. An officer stepped forward, snapped a salute, and pronounced the initial salutation. It was in Scottish Gaelic. It rang loud and solitary across the hushed stadium. In the space of a few seconds the strange, ancient syllables had shredded my scepticism just as the Latin anthems of evensong can shake the convictions of an atheist. Culloden and its aftermath had not destroyed the Gaelic language or highland military traditions. It had radically changed them, certainly, but it had not destroyed them. I calmed down and sat back ready to enjoy the show. There was literally a cast of thousands, with thumping drums and screeching wheeling bagpipers, highland dancing girls in flouncing kilts, Bollywood dancers in swirling glittering saris, undulating Chinese dragons, Swiss drummers clattering with staccato precision, and much more. And what was this? The brass band of the Chinese People’s Liberation Army!? Unbelievable but true. And did they play the “Internationale” or “The East is Red”? No way. They oompah-oompahed up and down the parade ground playing “Scotland the Brave”. The show was indeed jingoistic, kitschy, over-the-top, crass and clunky but it was also colourful, entertaining and emotive. It had all the coherence of a Jimmy Chung dinner and it was just as delicious. Like the great mass spectacles of North Korea its main function was to make art from the military necessity of discipline and precision. And despite myself, I was willing to be taken in. The clincher came towards the end. In a sudden cocoon of silence a solo piper sent out a Scottish lament from high on the walls of the castle. It was emotionally manipulative, sure, but even knowing this, I found it moving. It had – dare I say it? – meaning far beyond the froth of words. So I can’t translate it into words. All I can do is urge you to listen to it when the inevitable replay of the Tattoo hits TV screens later this year. The Royal Military Tattoo about to get under way as the rain dries up and night falls over Edinburgh Castle. You put your life on the line whenever you eat in a Scottish pub, Lois. But risking one’s life in this way is a measure of devotion to one’s Scottish heritage, so I continue to do it. Heroic eh?